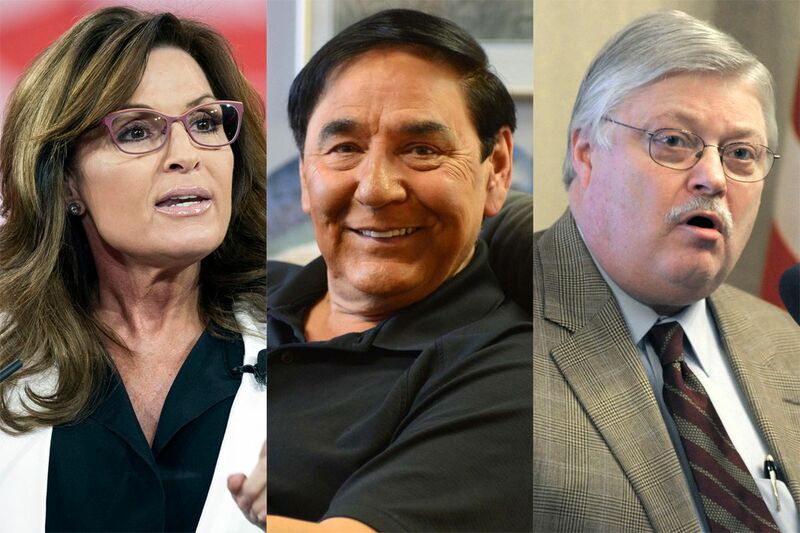 Alaskans Sarah Palin, Jerry Ward and Bob Gillam all have connections with President-elect Donald Trump. As Donald Trump heads into his new position as 45th president of the United States, Alaskans may be wondering who might be speaking for the 49th state. So far, it's a short list. At the top of the pile is former Gov. Sarah Palin, who spent election night in New York City, vindicated for her early support of Trump's candidacy. Alaska for Trump campaign chief Jerry Ward, a former state legislator from Anchorage, has some insight into Trump's thinking, but the advisement doesn't really go the other way. 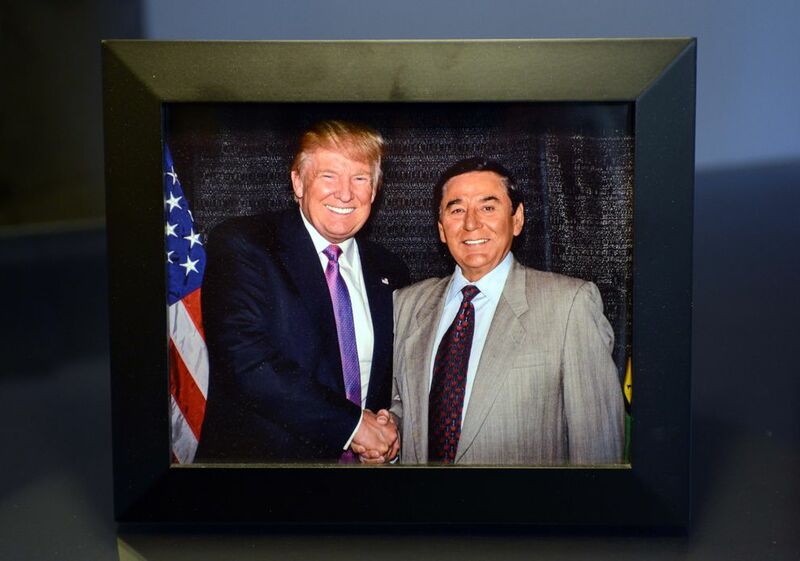 One of the wealthiest people in Alaska, Bob Gillam, has known Trump since they attended an Ivy League college together, and said he's been in touch with the president-elect throughout the past year. Trump's sons have fished here. His grandfather may have passed through the state during the Klondike Gold Rush, but eventually made his way to New York City. Palin has stumped for Trump, was an early supporter and though she wasn't publicly involved for much of the campaign, she was the candidate's guest at the third debate, helped with a last-weekend get-out-the-vote push, and celebrated with him election night at the Manhattan Hilton. Trump has said Palin would be a welcome addition to his administration, though it's unclear if she has a real interest in a Cabinet spot (or the public scrutiny that goes along with the confirmation process). But there are many White House and high-level advisory positions aside from the rigorous and often-unglamorous Cabinet secretary posts. But Gillam's son did graduate from Wharton in the same class as Ivanka Trump, the president-elect's daughter, he said. The two have been in touch over the course of the campaign, mostly over email, Gillam said in an interview Wednesday, in which he described himself as "old and gray and happy today" on the day after Trump's election. Gillam, well known for his opposition to the proposed Pebble Mine, said he has "not really" advised Trump about Alaska issues. But he said he thinks "Donald Trump will be good for Alaska's energy sector. I think he'd be good for the energy sector of the United States." Gillam said environmental regulations are too stringent for the energy sector and he believes Trump will support more American oil exploration, and a reduction in regulations. "Donald Trump is very well informed about everything. He didn't get to be a multibillionaire without paying attention" to what is happening around him, Gillam said. And he understands plenty about the energy sector and Alaska, he said. "I think Donald Trump will be a breath of fresh air for Alaskans," Gillam said. Ward was the Trump campaign's only official staffer in Alaska. He runs a real estate business in Anchorage, at one point held positions in the state House and Senate and is well known for his role in efforts to bring a for-profit prison to Alaska. The "campaign was a movement, now it's time to get the job done," Ward said Wednesday. The big ticket item, he said, is energy. "Mr. Trump has said to myself and other Alaskans that he expects America to become energy independent." That means developing coal, opening up the Arctic National Wildlife Refuge to drilling, getting a gas line in place, and feeding Alaska's "bread and butter," the "tourism and the fishing industry," Ward said. "Those are all issues that are on Mr. Trump's radar," he said. "He knows that Alaska is ready to do environmentally sound development of our resources." And "he understands the tourism industry probably better than any president we've ever had and he certainly has been briefed on commercial fishing and sportfishing of Alaska," Ward said. "That I know because he brought it up to me." Nobody has ever really accused Trump of being an "outdoorsy" guy. But his sons, Eric and Donald Jr., both close, trusted advisers, are avid hunters and outdoorsmen. While their father is straight out of Queens and restricts his outdoor time to golf courses, his sons both spent long stretches of summer with their maternal grandfather in then-Czechoslovakia, where they learned to hunt and "how to gut a wild boar," according to a profile in Outdoor Life. This August, Trump's sons dropped off the campaign trail to go caribou hunting in Canada. Trump's sons have an insight into — and perspective on — federal land management and conservation issues due to their hobbies that's likely to translate to the president-elect. In the same Outdoor Life profile, Don Jr. relayed his father's joking insistence that his son might make a good Interior secretary. "My father was talking about how to make America great again when he turned to me from the head of the table and joked, 'Don, you'd make a hell of a Secretary of the Interior; no wait a second, you'd probably just go to Alaska to check on how our policies are affecting wildlife and never come back," he said. In an interview with a Wilkes-Barre, Pennsylvania, newspaper about his hunting hobby, the eldest Trump son said he spearheaded a 10-day fishing trip in Alaska for his brother Eric's bachelor party. He brought then five-year-old Donald Trump III along on the trip, considering it a good time to bond "in the middle of nowhere." The owner and publisher of Alaska Dispatch News, Alice Rogoff, is not currently in contact with the president-elect, but has traveled in some of the same social circles over the years. She held at least one family event, years ago, at Mar-a-Lago, Trump's country club in Palm Beach, Florida.